The Rim Loop is located in Dead Horse Point State Park near Moab, Utah and the Island in the Sky District of Canyonlands National Park. Dead Horse Point State Park has about the same look and feel as a national park or monument. There is a Visitor Center with a gift shop and displays, a concession stand that has food and ice cream, a campground that is usually full (so make reservations) and a very nice picnic area at the point. 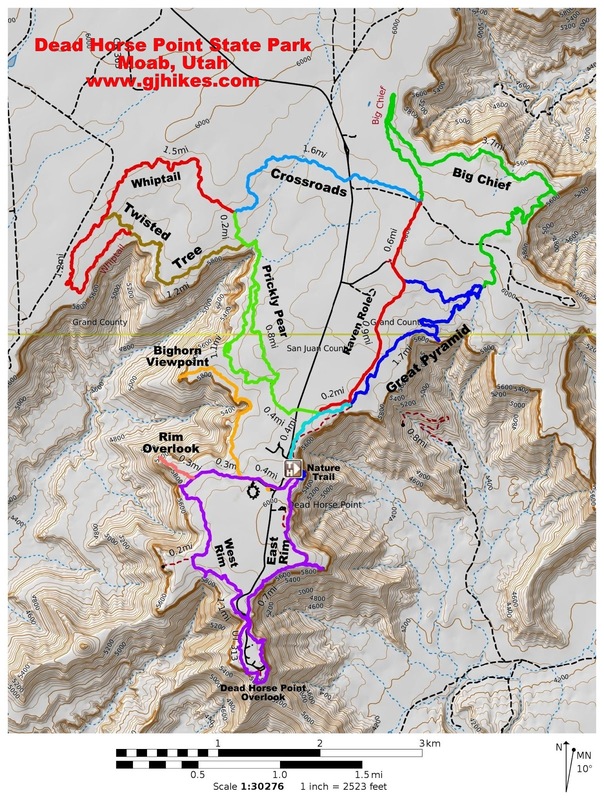 The Rim Loop is made by joining the East and West Rim trails with the Point Loop trail to create one big loop that is about 4 miles long. There are 4 or 5 additional overlooks that you can hike to along the way that can add up to 4 more miles to the hike. This post is for a hike that came out to just over 5 miles in total distance. Hiking the loop in the clockwise direction by doing the East Rim first is the quickest and easiest route to get to Dead Horse Point. The trail has a few small hills but for the most part it follows the rim and the changes in elevation are minor. The trail is well worn and marked with cairns making it easy to follow. If you haven't hiked the Nature Trail yet you will probably wonder about the sky blue ponds that contrast so nicely with the surrounding red dirt. They are the solar evaporation ponds of a potash mine that uses water to bring the salt to the surface where it is then evaporated away. The Basin View is the first of the overlooks that you will come to. If you choose to hike to the overlook it will add about a half mile to the overall distance and about 73 feet of additional elevation change. The trail descends for about a quarter mile to an overlook where you can get a closer view of the Colorado River and the surrounding canyons. The view is nice but it isn't that much different than what you will see if you continue a little further along the East Rim trail. It is a good spot though to scare up a deer or bighorn sheep. As the angle of the sun changes and the clouds come and go so does the view of the canyons seem to constantly change. As the trail reaches Dead Horse Point the ridge narrows to only a few hundred feet. 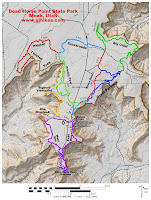 At this point both the East and West Rim trails are separated by only the access road. As the trail continues around the point there are many view points and this one quaint little view port. The trail is paved in the area around the point making it partially wheelchair accessible and more than adequate for baby strollers. A large shelter at the end of the point provides a little relief from the scorching summer sun. There are also restrooms with flush toilets and covered picnic sites with charcoal grills. The Colorado River can be seen below the point rounding a horseshoe bend. Rafting trips from Moab to Lake Powell that take anywhere from 3-7 days pass through here. There are several more of these horseshoe bends on that trip. At a couple of them rafters can disembark and climb over the ridges where they will pass ancient ruins and meet their raft as it comes around the bend. Of course, if you make the trip you will also have to pass through Cataract Canyon with its building sized rapids. It really is quite fun if you ever get the chance. After rounding the point the pavement eventually runs out and you are heading back by way of the West Rim trail. The West Rim trail is about a mile longer unless you hike out to any of the overlooks. Deer are among some of the wildlife that you might catch glimpses of. This doe is feeding on the tender leaves of a bush. The views from the Meander Overlook on the West Rim trail make the whole hike worthwhile. Three of the overlooks, if you choose to visit them, will add from 1/4 to 1 mile each to the total distance. The views of the canyons and the Colorado River from the area around Dead Horse Point are like a smaller version of the Grand Canyon. The canyons continue to erode, little by little, with each storm that passes through sending flash floods of water washing down the slopes carrying the soil with it. Most of the soil ends up getting deposited around the Hite Crossing area where the Colorado River slows down as it enters Lake Powell.Whether on a Sunday drive looking for a place for a picnic or on a weekend camping trip Dead Horse Point is a beautiful year round destination. If you would like to see it for yourself then all you have to do is 'Take a hike'.